Original log cabin studio of the Wyoming pioneer artist, author, and naturalist. The studio is maintained as it was when Mr.Kleiber used it for painting. It is open during the summer (free). Site of the attack by troops commanded by Gen. P.E.Conner on the Arapaho village of chief Black Bear in 1865. The battlefield is five miles east of Dayton on Hwy 14 in the Ranchester City Park. Site of battle between Col. James A. Sawyer and Arapaho Indians. There is an information marker on US. Hwy 14 between Dayton and Ranchester describing the fight. Twenty room ranch house containing western art,rare books, and antique furnishings. Victorian mansion built in 1908 for John B. Kendrick, Wyoming cattleman, Governor and Senator. The mansion is maintained as a state historical museum containing art, military and pioneer relics, and Indian artifacts. The carriage house has been converted into a theater. The Trail End website has their schedule. Built in 1893 by Buffalo Bill across from the original RR depot. Listed in Ripley's Believe It or Not as "the house of 69 gables." Located in downtown Sheridan in the King Ropes building. King Ropes is the cowboy's favorite source of lassos and other tack. The museum contains old saddles, carriages, and tools of the cowboy trade. The Big Horns, a scenic mountain range with fantastic rock formations, rises within 5 miles of Dayton. Some of the wildlife found in the Big Horns are elk, bear, deer, and moose. There are accessible streams and lakes for fishing and beautiful mountain trails for hiking and mountain climbing. Hang gliders take off from Sand Turn during the summer and there is sledding, skiing, and snowmobiling for winter fun. The Big Horns are not as crowded during the summer so it is possible to see the wildlife in a natural setting instead of surrounded by crowds of photographers. The Big Horns Page gives a brief tour of the impressive scenery of this mountain range. Outpost on the Bozeman trail located in the middle of Indian hunting grounds. Located 20 miles S. of Sheridan near the sites of Fetterman and Wagon Box Battles. The Indian_Wars_Battlefields page has more information. 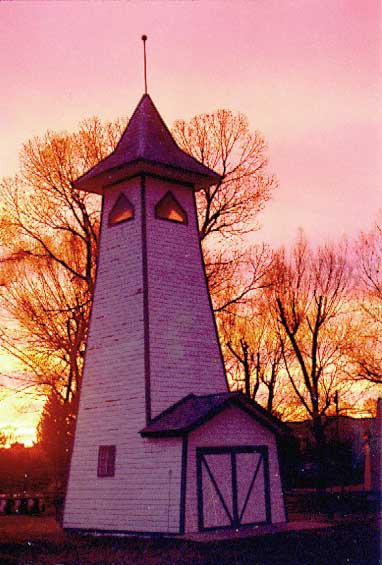 The Fort Phil Kearney website has detailed information about the fort.